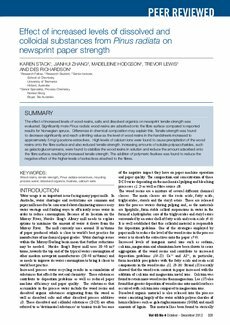 The effect of increased levels of wood resins, salts and dissolved organics on newsprint tensile strength was evaluated. Significantly more Pinus radiata wood resins are adsorbed onto the fibre surface compared to reported results for Norwegian spruce. Differences in chemical composition may explain this. Tensile strength was found to decrease significantly and reach a limiting value as the level of wood resins in the handsheets increased to approximately 5 mg/g acetone extractives. High levels of calcium ions were found to cause precipitation of the wood resins onto the fibre surface and also reduced tensile strength. Increasing amounts of soluble polysaccharides, such as galactoglucomannans, were found to stabilize the wood resins in solution and reduce the amount adsorbed onto the fibre surface, resulting in increased tensile strength. The addition of polymeric fixatives was found to reduce the negative effect of the higher levels of extractives attached to the fibres.